A fine piece of work on the Ohio charter school fraud from Cleveland Scene News. Helloooooo, Governor Strickland. Suddenly, six groomed businessmen, cologned with importance, stroll in behind an absolute giant of a man, clad today in grandpa sweater and signature 10-gallon white cowboy hat. The giant approaches tiny me. I already know who he is: Mister David Brennan. I don't know whether to sit or stand. I stand. "Amy, nice to meet you," booms the giant. "I was hoping you could tell my colleagues and I why you enjoy being an adviser here." He gestures to the businessmen standing at the threshold of my canvas-and-metal cage. I lean back, grasping the desk, hoping to mask my fear of saying something stupid or, worse, not being able to come up with anything to tell this important-smelling man, who holds my job in his extremely large hands. The businessmen, having now been formally introduced as the Board of Education of Mr. Brennan's own White Hat Management, gaze at me with tight, polite smiles, folded hands, and expectation so forced that I gun instantly for what I know they want: The Canned Answer. "I love working here because I think there's no better feeling than helping kids succeed at education." The important men coo. Mr. Brennan is pleased. Here I am, smack in the presence of Mister Billionaire, who owns half the city of Akron and the charter school I work for, and I beam like it's my job. As the men resume their tour of the cubicled "school," I overhear Mr. Brennan turning to one of the suited men, saying with conviction, "Internet-based schooling is the education of the future. As long as a child has a computer, he can learn wherever and at any time of the day. I believe this is the future of public education today." The men coo again. I can still smell their aftershave as they stroll on, the big man with the big hat towering over them. Employees welcomed the excitement interrupting another mundane workday when we were informed via e-mail that "Mr. Brennan is coming -- clean up your cube!" Sure enough, he'd come with a suited entourage of investors, business partners, and local officials to display his creation and talk to the animals chained to headsets in walled cubes, gazing into identical blue screens. In many ways, we were like the rest of corporate America. But this wasn't supposed to be corporate America. This was meant to be the Forefront of Education, where technology meets classroom. This was White Hat Management. The privately owned company was founded in 1998 by industrialist and self-proclaimed "education activist" David Brennan. And as his publicly funded, privately operated chain of charter schools erupt like a bad rash across Ohio and the rest of the country, one could say it's Mr. Brennan's way of turning education into big business. White Hat is the largest charter school operator in Ohio, with over 16,000 students and 34 schools, including Hope Academies and Life Skills Centers. "If Brennan's White Hat charter-school chain was a recognized school system, it would be Ohio's ninth largest based on enrollment," a 2005 press release boasts. Like McDonald's, White Hat serves as many kids as possible as cheaply as possible. But what many don't know is how White Hat is making millions and funneling scarce education money to profit a private empire. Before White Hat took me on board, I was substitute teaching at Kent City Schools, but an impending funding crunch would soon force cutbacks. All full-time temporary teachers were required to have teaching certificates. Since I didn't have one, I applied at a local temp agency. That's how I landed the job at the Ohio Distance & Electronic Learning Academy, Brennan's internet school, where kids are supposed to earn their high-school diplomas online. With buildings being shut down and teachers being canned in droves across the state, White Hat seemed to be the only place hiring. I was brought on board as an academic adviser. It seemed like a pretty cool gig at the time; I would be helping students graduate, via phone and e-mail, from a cubicle farm in downtown Akron. On my first day at OHDELA, I was shown to my cube, given a large gray binder, and ordered to copy my own training manual. One week later, promptly at 8 a.m., a huge pile of messy files and the educational fates of 150 students were handed down to me by four overworked and mentally scattered advisers. It was the beginning of the school year. Enrollment was picking up rapidly. The little online high school was approaching an enrollment of 1,500 kids -- with a staff of only 30 to 40 teachers and advisers to steer their education. We never actually met kids face-to-face. All tests are done online, and homework is e-mailed to teachers, who are housed in the same cubicle farm as advisers. White Hat sells education as an all-expenses-paid package deal, promising families "individualized home-based educations . . . from the comfort and safety of home." Students are promised a free computer and "teachers who are dedicated to supporting families and students." But during my first week as an "academic adviser," I almost drowned in a flood of desperate phone calls, e-mails, and voice mails that piled up before I arrived. There were frantic calls from kids and parents who'd just gotten their computer and didn't know where to begin. There were students who'd been enrolled for months, but had made no progress because they didn't know how to log in or find their classes online. It became clear that we advisers were hired as an afterthought to rescue families stuck in White Hat's cyber black hole. While the teachers waded through hundreds of papers from faceless students, the advisers were the students' lifeline, there to bridge holes and bandage gaps in an organization that was thrown together in a hurry. Parents rejoiced that there was finally someone to answer their calls, yet were soon dismayed to discover their child was desperately behind. A good percentage had proceeded blindly under the notion that by simply logging in to "Learning Opportunity Hours" -- i.e., attendance hours -- they would be automatically propelled to the next grade. Advisers had the unfortunate task of informing them that they still had an entire list (and a lengthy one) of tests and assignments to complete for each class, as well as another list of classes they must complete before moving on to the next grade. "Don't worry," we were instructed to tell discouraged families. "At OHDELA, you can work through the summer and you can stay enrolled until you're 21, so you've got plenty of time." After all, the longer they stayed, the more money White Hat received from the state. My job at Mr. Brennan's gerbil cage was contacting students and parents every two weeks, telemarketer-style, and attempting to hold kids accountable for their progress. More often than not, there was no progress at all for a variety of excuses -- valid and not -- concocted by students who seemed less interested in their educational well-being than I was. Faced with choosing between the importance of their education and the irresistible allure of the Xbox, the odds weren't good. So every day at 8 a.m., I strapped into my headset and launched into my 30-plus Cheerleader/Bad Guy phone calls, for 11 bucks an hour with zero benefits. Parents, I often found, were too busy working one or two jobs to be responsible for their child's progress. Accountability for the student fell to me, and all I could do was call, threaten, persuade, and call some more. Occasionally the school offered money to bribe students into finishing their classes. Could you imagine getting 20 bucks from your public-school teacher for finishing Algebra I? The trouble with online schools is inherent: Teens are expected to be mature enough to school themselves. But with no face-to-face interaction with parents or students, the school has no control, and accountability ultimately falls by the wayside. Every day I'd receive a call that someone's hard drive crashed or contracted hundreds of viruses, leaving students unable to work until a loaner was sent. As White Hat bureaucracy would have it, that meant a two- to three-week wait. Missing that much time at a normal school would prompt calls to principals and social workers. But at White Hat, it was all too common for students to miss weeks, even months, over technical difficulties alone. After a few weeks, I had a clearer understanding of why these families came to OHDELA. Their stories had a common thread: They were looking for something better than their local public schools. Kids heard about the online school from other kids and begged their parents to enroll them. Kids naturally found it a cool idea. It meant sleeping in, not having to go to class. To their parents, it meant having their child at home instead of exposed to increasingly dangerous neighborhoods. White Hat sold it as a win-win deal. We have the internet now! We can go to school without getting out of bed! It's the age of technology! It also meant a free computer to families who'd never owned one. Unfortunately, many of the students I spoke with didn't even own a desk or chair. They were attempting to complete a high-school education on the floor of their bedroom, while the rest of the family vied for use of the brand new toy. I left my cubicle every day feeling sorry for families who were lost and confused. Many had enrolled in our school as a last resort, and we left them more discouraged than ever. As I diligently explained buttons and links and log-in hours from the other end of the line, I could sense the students' declining hope of ever receiving a high-school diploma. White Hat, meanwhile, seemed more preoccupied with charting spreadsheets, calculating endless employee performance measures, appeasing streams of irate mothers, and raking in cold, hard state cash. Organizationally speaking, it was a nightmare on steroids. The place was built on a lopsided pyramid of spreadsheets, spreadsheets, and more spreadsheets. I was given the daily task of updating huge Excel workbooks with student data and test scores. Copies would circulate throughout the office, so that no two staff members had the same information about one student. Every morning I arrived to stare eight more hours of drudgery in the face. It was one of those jobs that are traumatic to any creative, intelligent mind. I had to admit to myself that it really was nothing but a poorly run credit factory with killer marketing. I've never witnessed lower morale at a workplace. Rumors circulated, cliques gossiped, managers took sides, and everyone had a cynical attitude toward the company. Many of the young, inexperienced teachers were hired straight out of college or after long bouts of trying to find "real teaching jobs." They became resigned to their roles as cubicle slaves, with no control over the material they "taught." I felt dirty, like I'd landed in the middle of an illegal operation. I wanted to say something. But White Hat was paying my rent, just as it was everyone else's. And after nine months of working through the temp agency, the company finally hired me and handed over some benefits. Though students could pretty much do as they pleased, staff was under strict control. We swiped in and out with special badges so that every move, every bathroom break, was tracked. Time at your computer was logged electronically to ensure you were available to answer the phone not a minute less than eight hours a day. Phone calls and e-mails were meticulously charted. If your performance wasn't up to par, you'd be summoned to the principal's office for a middle-management-style wrist-slap, and your chart soon contained the notation of troublemaker. Each Tuesday at 9 a.m. sharp, we attended mandatory meetings in which our numbers were run. Our manager prided himself on being a "numbers guy." Our phone calls were graphed individually and in relation to co-workers' numbers, then were printed out, stapled, and handed to us on our way into the meeting. We'd talk about changes and details we had to keep track of. We gazed at fancy graphs, stats, and bell curves. But we didn't talk much about improving the educational experience of our students. White Hat sells itself as a solution to at-risk kids and staggering dropout rates. But our school seemed almost perfectly designed for those kids to fail. A large portion of the students arrived from poorer districts and the other side of the digital divide. Many were transferring directly out of Cleveland and Akron city schools, and most lacked basic computer skills. I remember one mother who called to ask if e-mail could be received while the computer was turned off. Most of the 150 students I worked with needed slow, methodical instructions just to attach a homework assignment to an e-mail. Of course, it borders on the impossible to complete four years of internet high school when one can barely operate a computer. The Enrollment Department was supposed to screen for this type of thing. But each student meant another $2,500 from the state. Whether we could help a kid or not was irrelevant. At OHDELA, the only tools students were given were books that arrived via snail-mail, a $600 computer, and advisers like me. Overhead at an internet school is minimal. A Columbus Dispatch investigation revealed that "nearly a third of the state funding received by each school was pocketed by Brennan's operation." During my year at White Hat, many students came and left, yet I witnessed very few who made progress. I attended the first graduation ceremony of the school's existence. It was a big event, the kind Brennan loves to throw -- with caps and gowns, valedictorians, and truly bad motivational speeches. Twenty graduates out of a school of 1,500 made for a rather pitiful commencement march. It's no secret that Brennan's schools are failing -- at rates far worse than the abysmal public schools they're meant to replace. White Hat's 20 Ohio Life Skills Centers, for example, are all on either academic watch or emergency. Not one meets the federal standard for yearly progress. They do, however, meet Brennan's notion of a lucrative enterprise. State audit reports expose the Life Skills Centers as the real moneymaker. The schools, which target low-income students, are often housed in strip malls, herding three shifts of students through per day. They offer no music or art programs, extracurriculars or cafeterias. Where the rest of the money is going is anyone's guess. Since teachers and administrators are technically employed by the entity of White Hat, not by the schools themselves, the company refuses to divulge such basic information as how many teachers it employs or what qualifications they hold. The arrangement is beneficial for keeping state auditors at bay. A whopping 97 percent of White Hat's expenses are simply recorded as "professional services contracts" -- with the company providing unknown services to itself. To legislators preaching fiscal responsibility, allowing such accounting tricks would seem the height of negligence. In 2005 alone, White Hat received $109 million from the state. Only Brennan knows where most of it went. But he's hedged his bets by shoveling millions to those charged with overseeing state money. According to Sue Taylor, president of the Ohio Federation of Teachers, "Brennan and his family [wife Ann and daughter Nancy] gave $3.8 million to Republican lawmakers between 1990 and 2005." A sizable portion of that went to former state auditors Betty Montgomery and Jim Petro, both fiscal conservatives who nonetheless showed little interest in exploring where the state's money was going. "Ohio taxpayers have no idea how the vast majority of the money going to Brennan's White Hat chain is being spent," says Taylor. "And no one is riding in to put a stop to it or ask what's happening to these children, because David Brennan makes big political campaign contributions." I remember when U.S. Secretary of Education Rod Paige came all the way from Washington to visit our little school. It was the morning of the company Christmas party, when we were coerced into performing mandatory skits for no beer, no bonus. Paige was coming that day under the guise of witnessing how his buddy, Mr. Brennan -- lavish contributor to the Republican Party -- was revolutionizing education in Ohio. Prior to his arrival, we'd been given strict direction on how to act if Mr. Paige approached us. Appointed employees were instructed to rehearse an inspirational story or anecdote. The secretary arrived with his own entourage, even more important looking and smelling than Mr. Brennan's. I peered out from my corner cubicle; we weren't to leave our desks for any reason. There was Mr. Brennan in signature white cowboy hat. He was guiding Paige around the office, allowing the cameras to capture all the back-patting and hand-shaking. Today, the school's website advertises a quote from Paige, who, upon his return to the White House, called OHDELA "the future of education." Since then, White Hat has used the school as a model to create clones from Florida to Colorado. It now operates 50 publicly funded schools in six states, serving 23,000 students. I witnessed firsthand Mr. Paige's "future of education." If he's right, America's own future is in deep trouble. Achieve, Inc., which is leading a charge in New Jersey to have corporations decide the curriculum for New Jersey high schools, has another pet project aimed at further disenfranchising the disenfranchised: the elimination of the alternative graduation test that offers high school seniors such as English language learners and students in poor schools an optional assessment that may help them gain a regular high school diploma. New Jersey's Special Review Assessment: Loophole Or Lifeline? Eliminating the Special Review Assessment (SRA) could dramatically raise dropout rates and threaten New Jersey's claim to having one of the nation's best high school graduation rates, according to a new report on the state's alternative route to a high school diploma. The report recommends significantly reforming the SRA process, but says that eliminating it "would, almost by definition, constitute bad public policy." "We have the highest high school graduation rates in the nation," boasted Governor Jon Corzine in his 2007 State of the State address. "Whatever we do, we must keep and enhance the nation's best school system." The new report argues that ending the SRA would undermine those goals, especially hurting English language learners, immigrants and those in the urban "Abbott" districts, while doing little to improve school programs. If the SRA were eliminated, the biggest impact would be on English language learners, immigrants and those in the urban "Abbott" districts. However, because nearly 60% of all SRA students are from non-Abbott districts, the impact would be felt statewide. Patterns of SRA use suggest a crisis in NJ mathematics education. By an almost 2 to 1 margin, more students use the SRA to satisfy the state's math standards than the language arts standards. This raises significant issues about NJ math education and about opportunities to learn, including access to certified math teachers and high quality instruction. The study found that the SRA's "performance tasks" were "rigorous" and aligned with the HSPA. But it found that uneven implementation practices and inconsistent scoring across districts undermined the SRA's credibility as an assessment tool. The report recommends improving the reliability of SRA scoring by using regional teams of NJ educators who are not evaluating their own district's students. The report found that there has been little research on the educational experiences of SRA students, or on their postsecondary outcomes compared to those of HSPA graduates or high school dropouts. "At this point New Jersey has no technical capacity for assessing any postsecondary outcomes," it states. "We really don't know if HSPA graduates fare better, worse or the same as their SRA peers." The report urges "caution in making graduation policy changes with high-stakes consequences for students and school communities" until such information is available. Years of debate about reforming or replacing the SRA has led to considerable uncertainty about its current status. In August 2005, the New Jersey State Board of Education proposed phasing out the SRA beginning with the freshman class that entered in September 2006 for language arts and the freshman class entering in September 2007 for math. However, the State Board deferred final action until the Department of Education developed "alternative opportunities for students to demonstrate the achievement of high school graduation requirements." Those alternatives are still pending. This fall both freshmen and sophomores and their teachers will return to school uncertain about the availability of the SRA as they approach graduation. Schools and districts face similar uncertainty about sustaining their supplemental instruction programs for potential SRA students (some of which involve early identification of students in 9th and 10th grades). Another consideration is the timeline for implementing the state's Secondary Education Initiative (SEI), a major reform effort currently underway to introduce college preparatory curricula, small learning environments and improved family/student supports to all Abbott middle and high schools. According to the report, "Eliminating the SRA before significant and demonstrable improvements are made in secondary programs and supports could have a major negative impact on graduation rates, dropout rates, the SEI reform effort, and the prospects for broader reform." "Such a menu of assessment strategies would assure that all graduates meet New Jersey Core Curriculum Requirements without insisting on one-size-fits-all," says the report. "It is important not to confuse 'assessment reform' with educational improvement. The proper purpose of educational assessment is to improve teaching and learning and to support better outcomes for the greatest number of students. Reform efforts should strengthen this fundamental purpose and resist tendencies to sort and label young people...."
The report and its recommendations have also been endorsed by a number of well-known national education experts, including Linda Darling-Hammond of Standard University who said, "The SRA is one reason why New Jersey has both very high achievement levels and very strong graduation rates... [it] reflects an approach that a growing number of states are seeking to emulate as an essential part of effective secondary reform." If you thought that Katrina relief from Bush Co. depended largely upon political affiliation, you would be right. Lardy lobbyist turned goveronor, Haley Barbour (R), of Mississippi, has received disproportionate amounts in relief for his cronies as compared to Blanco's (D) Louisiana. And if you thought that most of the aid that IS going to Louisiana is going outside New Orleans, you would be right again. The giant steel beams of Price LeBlanc's new Toyota dealership reveal an emerging structure that rivals the size of many sports stadiums. Hundreds of construction workers swarm the site, assembling what will soon become a $20-million vehicle showroom — all funded through federal tax breaks. After hurricanes Katrina and Rita, Congress approved billions of dollars in tax-free bonds to stimulate rebuilding along the Gulf Coast. It's called the Gulf Opportunity Zone — or GO Zone — and includes dozens of counties in Louisiana, Mississippi and Alabama. But as new developments like Price LeBlanc's Toyota dealership cash in on federal aid, a trend is taking shape. The dealership is in Baton Rouge, nearly a hundred miles inland from Katrina's wrath.
. . . .As of the start of this academic year, the federal government has committed roughly $2.5 billion to relief and recovery relating to education after Katrina, the report says, citing the Congressional Budget Office and the U.S. Department of Education. That amounts to two percent of the country’s Katrina-related disaster funding. Hurricane funds made up less than 2.5 percent of the U.S. Education Department’s expenditures over the past two years, according to the report. A few months after Katrina, in an effort to quantify the storm’s effect on 27 colleges along the Gulf Coast, higher education associations put together a comprehensive estimate of $1.2 billion in estimated physical damages to the campuses (which those who calculated that amount said was conservative), and potential losses of $230 million in tuition refunds to students who left or were expected to leave. In December 2005, Congress approved $200 million in aid for colleges, which was split largely between Louisiana and Mississippi — with a small percentage going to institutions that temporarily housed transferring students. Subsequent supplemental appropriations of less than $100 million have also gone to assist higher education. Much has been said about how the federal aid was distributed. The Louisiana Board of Regents determined in early 2006 that $75 million of the initial aid would be spread across its institutions based on a formula taking into account enrollment, lost tuition revenue and financial aid budgets. (And, controversially, not physical damage caused by the hurricane.) Colleges there also used $8.5 million in federal funds to offer special need-based scholarships for displaced students to return to both public and private colleges in Louisiana. Distribution of funds was based on the number of students colleges had in fall 2004 who were from areas affected by Hurricanes Katrina and Rita. In that first round, Tulane University, with a large student body and higher tuition than other institutions in the region, received the most aid, followed by the University of New Orleans and Delgado Community College, the two-year college of New Orleans. Dillard University, which had roughly 2,000 students but incurred the worst physical damage, received less than the others. Mike Strecker, a spokesman for Tulane, said the university hasn’t paid attention to and is not concerning itself with funding comparisons among Gulf Coast institutions. The report cites state and federal figures showing that even though Louisiana suffered more than four times the damage to its campuses than did Mississippi, the repair funding it received is only marginally greater than its neighboring state. “Where is the equity in education resource allocation?” Huntley asked. Steve Suitts, the report’s author and program coordinator at the foundation, said it makes no sense that Louisiana colleges, hit hardest by the hurricane and also by enrollment drops last fall, wouldn’t receive the lion’s share of the funding. The Education Department should focus more on distributing aid based on need, he said, particularly because the Louisiana colleges also are the ones educating some of the poorest students. Suitts called for better tracking of students who move in and out of colleges in the region. Data show that the South still maintained the largest share of the students who transferred after Katrina, though many others went to the coasts. . . .
SALT LAKE CITY (ABC 4 News) - Some of Utah's best teachers are taking to the streets. They’ve launched a state-wide campaign to fight the voucher law that will be on November's ballot. If the proposed law is passed, millions of dollars will go towards helping families that want to send their kids to private school. These advocates are claiming that the law is fundamentally flawed. They say it will not help the majority of Utah families. These advocates say the two major problems with the proposal are accountability and accessibility. They say unaccountable voucher schools may hire teachers who are not certified, and don’t have to meet the same course work and attendance standards as public schools. In terms of accessibility, they say vouchers will not help the majority of Utah families. More than half of Utah’s counties do not have private schools at all. Using hundreds of millions of taxpayer dollars for the voucher program is another concern. Instead, these educators believe the money should be used to invest in public schools where the majority of Utah students go. . . . If any department of the federal government operated under the level of scrutiny and distrust envisioned by the Miller-McKeon draft version of NCLB, another whole department would be required just to keep track of the paper. Miller and McKeon have that one figured out, though--they just plan to pass their impossible continuation of a pie-in-the-sky policy to the states to figure out. ‘‘(I) TIMELINE.—Each State shall establish a timeline for adequate yearly progress. The timeline shall ensure that not later than the end of the 2013–2014 school year consistent with subparagraph (F), all students in each group described in subparagraph (C)(v) will meet or exceed the State’s proficient level of academic achievement on the State assessments under paragraph (3). In short, the impossible targets and the accompanying assured failure remain unchanged. Email Congressman Miller to say SCRAP IT AND START OVER!!!!!!! Ed Week's "Learning the Language" has a spot to react to the draft, and thanks to Monty Neill's note at ARN, I found this reaction by Jim Crawford to the ELL revisions in the Miller-McKeon draft. Nice analysis. I'm still slogging through the 435-page draft of Title I -- a necessity, I'm afraid, because the summary isn't altogether accurate. There are provisions affecting ELLs throughout, but see especially pp. 67-87. Also note that a draft of Title III, which deals specifically with ELLs, has yet to be released. To quote Samuel Johnson out of context, I'd say that this reauthorization proposal reflects the triumph of hope over experience. Over the past 5 years, experience has revealed fundamental flaws in No Child Left Behind. But instead of fundamentally rethinking the law, Reps. Miller and McKeon propose to add new layers of complexity, apparently hoping to vindicate their rash creation. Especially where English language learners are concerned, I think the draft bill is unlikely to improve NCLB's garbage-in, garbage-out approach to accountability, which uses invalid, unreliable assessments for high-stakes purposes. 1. The bill mandates valid and reliable assessments for ELLs, but so does current law. We know how that's worked out: the vast majority of content assessments now being administered to these kids are English-language tests that nobody even bothers to claim are valid or reliable. All that would change under the Miller-McKeon proposal is that states would face a two-year deadline to develop valid/reliable tests or face financial penalties. The assumption seems to be that states have simply dragged their feet in meeting their obligations. But would it even be possible to develop English-language academic assessments that are valid for ELLs at many different levels of English proficiency? That's never been achieved, and I suspect that trying to do so is a fool's errand. 2. How about accommodations for ELLs taking tests designed for proficient English speakers? The draft bill would require states to use only those with "research-based" validity and reliability. None currently exist, and research in this area remains quite limited. Accommodations do not offer an easy solution, at least in the near term. 3. The bill would allow the use of portfolios and other alternate assessments -- potentially an improvement. But again, these types of tests are rarely available and would take time to develop. Meanwhile, the "inclusion" of ELLs, using inaccurate assessments for measuring "adequate yearly progress," would continue until most schools with an ELL subgroup would find themselves in "corrective action" status or worse. 4. The bill would allow states to use English language proficiency scores for beginning ELLs for up to 2 years, while valid/reliable assessments are supposedly being developed. It would allow them to exempt ELLs from language-arts assessments for their first 12 months in U.S. schools. And it would allow them to count the scores of former ELLs for AYP purposes for up to 3 years. Yet all of these provisions are arbitrary, unscientific, and unlikely to do much to mitigate the unfairness of the current system. Nor do they address the well publicized abuses that NCLB has created: emphasizing test prep to the exclusion of real teaching, stressing basic skills over critical thinking, and narrowing the curriculum to the 2 high-stakes subjects. 5. As a way out of this mess, Miller and McKeon rely heavily on expanding the use of native-language assessments. But they don't seem to recognize that only about 15 percent of ELLs now receive native-language instruction in core subjects. For those who lack literacy in, say, Spanish, native-language tests are inappropriate. 6. Yet the draft bill requires states to develop native-language assessments for any language group that makes up at least 10 percent of the state's ELLs. This would be a huge change. It would probably have some positive effects (e.g., for kids now in bilingual classrooms), along with some very perverse consequences. First, the good news. Ensuring that native-language assessments are universally available would relieve some of the pressure to push ELLs into English as rapidly as possible (which contradicts research evidence on best practices). It also might slow down the trend of dismantling bilingual programs because of anxiety about ELLs making AYP on English-language tests. Which would be good thing, in my view. On the other hand, the mandate could impose a crushing burden on many states. Virtually all of them would have to develop native language assessments in Spanish (or, e.g., in Texas, redesign these tests to make them valid/reliable). Some would probably have to do so in Tagalog, Hmong, Vietnamese, Chinese, Korean, Yup'ik, and possibly other Native American languages. Developing such assessments would be quite expensive and time-consuming, especially in states with new or diverse immigrant populations. It would be a foolish diversion of resources away from what they most need: professional development and technical assistance to develop schools' capacity in serving ELLs. This is where the feds could play a major positive role -- if only Congress could get over its assessment obsession. 7. Finally, there's a loophole in this provision requiring that native-language assessments for ELLs be "consistent with state law." The perverse effect here might be that many states would choose to outlaw such assessments, denying them to ELLs for whom they would be meaningful and appropriate. Looking at this draft -- a Rube Goldberg contraption if there ever was one -- I have to wonder whether Reps. Miller and McKeon heeded any expert advice on ELL needs whatsoever. Ignoring the views of most educators and researchers, while listening primarily to Washington "think tanks," proved disastrous in the first authorization of NCLB. Let's hope Congress can learn from its mistakes. LOS ANGELES ¬_ The Civil Rights Project/Proyecto Derechos Civiles at UCLA, one of the nation's leading research centers on issues of civil rights and racial inequality, today released a report examining the growing racial inequality in America's public schools. Offering evidence on how to realize the benefits of integration, the report, Historic Reversals, Accelerating Resegregation and the Need for New Integration Strategies, comes as school districts across the U.S. face the challenge of responding to the U.S. Supreme Court_s new limits on desegregation plans. Co-authored by Civil Rights Project Co-director, Gary Orfield, and Researcher Chungmei Lee, the report shows that resegregation was accelerating long before the Court's June 2007 decision, particularly in the South, where new 2005-06 school year data shows an historic reversal in the region's desegregation leadership. "Nearly two decades into the resegregation its earlier decisions helped create, the South is losing its huge gains in race relations in the civil rights era,_ said Orfield. _The country is likely to become even more separate -- shutting out rapidly growing Latino and Black populations from the strong schools and interracial experience they and our communities need if we are to be an economically and socially successful society. This goal is so important that educators and community leaders must find ways to support integrated schools in spite of the new limits." The report concludes that for the first time in more than three decades, the South no longer has the nation's most integrated schools and desegregation there is in rapid decline. The report also suggests that the frequently proposed use of social class desegregation as an alternative to assignment by race will be unsuccessful because of a declining relationship between segregation by race and poverty. Additionally, there is a substantial increase in multiracial schools where such policies would be far less likely to help integrate highly segregated black and Latino students. Findings also show that segregation has been increasing in all parts of the country before the recent court decision, largely because of a series of earlier negative rulings by the U.S. Supreme Court in the l990s. Orfield commented on the massive evidence presented in briefs by researchers to the U.S. Supreme Court last fall. That evidence demonstrated the inequalities of segregated schools along with the educational and social gains found in desegregated schools. Orfield described the Court's decision as an "historic blunder ignoring much more powerful evidence than what was before the Court at the time of Brown v. Board of Education, and sending the country back on a path that failed in thousands of communities embracing 'separate but equal' for six decades before Brown." The report notes that the Supreme Court decision will invalidate many desegregation plans that currently exist outside the South, and points out that a proposal by the U.S. Department of Education to change the racial categorization of students, if adopted, would make it impossible to effectively measure the impact of the Court's decision on school desegregation. It concludes with recommendations for school districts and communities that are trying to preserve racial diversity given the constraints of the Court's new decision. **White enrollment is down from 80% to 57% of U.S. students from 1968-2005; Latino enrollment has nearly quadrupled. **The percentage of U.S. students poor enough for free lunch has soared and all groups of students now attend schools with higher percentages of poverty than in the past. **Latino students are more segregated than black students, but both groups have a very high and growing isolation from whites. **Asians experience by far the most desegregated schools; whites are the most segregated from other groups. **There are now ten states where less than half of students statewide are white, and most non-white students live in these states. **Black students are now the fourth largest minority group in the West, following Whites, Latinos, and Asians. Black students tend to be segregated in schools with more Latinos than fellow blacks. **There is a powerful relationship between segregation and dropout rates. **America's large suburban school districts are rapidly becoming more diverse and segregation is rapidly spreading into the suburbs. If I had to design a system that is more of a disincentive for good teachers dedicated to children's welfare in schools where they are needed the most, I would be hard pressed to come up with something more efficient than the failure-inspired NCLB policies we have now. Not only are ethical teachers shying away from being recruited to guard and force feed children they would prefer to liberate and nourish, but teachers with a choice will not volunteer for duty in schools that are AYP time bombs set to blow up in their faces. There is no clearer domestic analogy to the Decider's adventurous horror in Iraq. Ask any GI or any teacher.
. . . .In June, the National Commission on Teaching and America’s Future, a nonprofit group that seeks to increase the retention of quality teachers, estimated from a survey of several districts that teacher turnover was costing the nation’s districts some $7 billion annually for recruiting, hiring and training. All the coming and going of young teachers is tremendously disruptive, especially to schools in poor neighborhoods where teacher turnover is highest and students’ needs are greatest. . . . .
An important question is whether the gradual gain in knowledge about NCLB is causing the public to have a more favorable or more unfavorable view of the law. Trend data for this question are reported in Table 2. While 31% say they have a very or somewhat favorable view of the law, 40% say they have a somewhat or very unfavorable view. The percentage selecting one of the two favorable responses has grown by 13% since 2003, while the percentage choosing one of the two unfavorable responses has climbed by 27%. An even stronger unfavorable view of NCLB is held by those who say they know a great deal or a fair amount about the law. If only it could have been one book. Such was my wishful thinking, infused with a certain anger, as I read "Letters to a Young Teacher" and "A Class Apart," two up-close accounts of two radically different public school experiences written by, respectively, veteran educator Jonathan Kozol and Washington Post reporter Alec Klein. Of course, I figured just by the titles and authors that I was in for much more contrast than convergence. Kozol, 70, is the unsparing social critic and fierce public-school advocate whose last work, "The Shame of the Nation," detailed the almost intractable nature of public-school inequality in America 50 years after Brown vs. Board of Education; Klein, 40, is a journalist who in his book appears less influenced by political ideology than by the tenets of modern feature writing, which include a conscious neutrality on deeper education issues. "Letters" uses the time-honored literary device of correspondence to steadily illuminate the long-standing concerns of the letter writer and those of Francesca, a novice first-grade teacher who toils in the tough, mostly black Roxbury area of Boston and who functions as Kozol's younger alter ego; "Class" is much more diffuse, full of characters, situations and odd moments meant to feel like an almost random year-in-the-life look at exclusive, high-powered Stuyvesant High School in New York City -- Klein's alma mater, by the way. . . .
Fairfax County schools boast SAT scores significantly higher than the national average. More than 93 percent of graduates go on to college or trade schools. And the dropout rate is low. But this week, the school system was given a new -- and negative -- label: failure to meet academic goals under the federal No Child Left Behind Act. Fairfax educators say the system as a whole, along with 68 of its schools, fell short largely as the result of tighter federal testing requirements for students with limited English skills. Officials and parents now face the question of whether the rating will tarnish the district's reputation. Liz McGhan, mother of three children in Fairfax schools and president of Garfield Elementary School's PTA, said the rating doesn't change her positive view of the schools. "For me personally, and for other people I talk to, school scores are not everything about the school," McGhan said. "I think a majority of the parents understand what's going on behind all the numbers. There's so much more to a school than the testing." School and county officials, who often cite the quality of schools as a lure for businesses and residents, argue that Fairfax's situation illustrates flaws in the federal law. "This is not a question of academic performance. It's a question of a rigid law," said Gerald E. Connolly (D), chairman of the Board of Supervisors. "The No Child Left Behind law does not make allowances for a highly diverse school systems such as we have in Northern Virginia." Federal officials disagree. They say that all students must be held to the same standards and that Virginia had ample time to adjust to testing requirements. "We know that some limited English students need an alternative assessment," U.S. Education Department spokesman Chad Colby said. "We're working with states, but [Virginia] could have done that going back to 2003." Many other Virginia school systems fell short of academic targets. But some reached them, including those in Chesapeake, Roanoke County and Virginia Beach. The federal law, which aims to shine a light on blocs of struggling students and allow schools to pinpoint areas that need improvement, requires annual reading and math tests in grades 3 through 8 and once in high school. It also requires schools, and school systems, to show steady progress in improving scores. Subsets of students -- including ethnic minorities, students with disabilities, those with limited English skills and those from low-income families -- also must show gains each year. If one group does not meet the target, the school or district may be designated as not making "adequate yearly progress," or AYP. Several other Northern Virginia school systems, including those in Alexandria and in Loudoun, Prince William and Arlington counties, also did not meet targets on the spring Standards of Learning tests. The number of Northern Virginia schools that did not make the grade nearly doubled, rising from 76 in 2006 to 146 this year. Education experts say school systems nationwide are experiencing similar increases. Each year, it is tougher for schools to meet standards, because states raise performance targets as they move toward the goal of having every child proficient in reading and math by 2014. In Maryland, for instance, the number of elementary and middle schools targeted for academic improvement because of low test scores rose this year from 167 to 176, the largest total since the No Child law was enacted in 2002. "The crunch is starting to be felt," said Jack Jennings, president and chief executive of the D.C.-based Center on Education Policy. "There's more tests, and there's a higher bar. The game is getting more challenging." The experience of Northern Virginia, and the question of whether student performance on standardized tests should be the sole measure of a school's success, is expected to play a significant role this fall as lawmakers debate reauthorization of the federal law. Rep. George Miller (D-Calif.), House education committee chairman, has called for additional measures, such as graduation rates or the number of students passing Advanced Placement exams, to be included in the ratings. Michele Menapace, president of the Fairfax County Council of PTAs, said parents who are not familiar with the intricacies of the federal law might question principals and school officials about the county's ratings. "I don't think people will be up in arms, but I think there will be questions asked," Menapace said. "There has been a great deal of confusion. All they see is that their school didn't make AYP, and they don't understand all the testing groups." Fairfax County School Superintendent Jack D. Dale said he is not concerned about the label. "What I hear from the community is, AYP information has become meaningless," Dale said. "Our parents want to know how kids are doing on a broad spectrum of assessments." With such fine reputations at stake, we can be sure that this game has just begun to change its rules. Newburgh – If you ask Jonathan Kozol, Ph.D. what the problem is as relates to public education in the United States, he will tell you there is too much emphasis on testing, especially in inner city schools; that class sizes are too large; and that much of the problem has to do with Washington. Kozol spoke at the inaugural Lucy DiPaola Institute for Professional Development for Educators, which is being held at Mount Saint Mary College in Newburgh through Thursday. “The greatest difficulty that these young teachers face is the testing-mania, the madness of repeated obsessive testing, that the White House has forced upon our public schools under the law called No Child Left Behind, which is probably the worst, most destructive piece of education legislation that I have seen in my entire lifetime,” he said. Kozol’s new book, Letters to a Young Teacher: The Challenges and Rich Rewards of a Beautiful Profession – the Service of Children and the Thirst for Justice, was available for purchase at Tuesday’s session. The Fairfax County school system for the first time failed to meet academic goals under the No Child Left Behind Act, largely because many students with limited English skills struggled on reading tests that were given in response to a federal order, according to school officials and scores released yesterday. Several other well-regarded Northern Virginia systems, including those in Alexandria and in Loudoun, Prince William and Arlington counties, also fell short of target scores on last spring's Standards of Learning tests. The number of Northern Virginia schools that did not make the grade nearly doubled, rising from 76 in 2006 to 146 this year. . . .
Eli Broad and Bill Gates have ponied up $60 million to "wake up the American people about their schools." The $60 million fuel a campaign to make education a major issue in the presidential election of 2008. No matter what its good intentions might or might not be, ED in 08 is shaping up as one of the sloppiest, most unprofessional, irresponsible campaigns in memory (why such a campaign is necessary in view of the schools being blamed for Sputnik (1957), urban riots (1967), "grim and joyless classrooms" (Chuck Silberman, Crisis in the Classroom, 1970), the SAT decline (On Further Examination, 1977), letting the Japanese eat our lunch, (A Nation At Risk 1983), and the myriad of recent publications about the Chinese and Indians threatening our lunch, is not clear. Broad is 73 years old. Did he sleep through all 50 years of this fuss? "China provides 30% more education than America..."
What on earth does this mean? Thirty percent longer year? Thirty percent more curriculum coverage? Thirty percent more years in school? Thirty percent higher test scores (China has never taken part in an international comparison for reasons that will be obvious momentarily)? A 30% longer day? I think this last might be true, but it is also true that most Chinese students get about two hours a day to go home and eat lunch. There is very little difference in how much time American and Chinese kids spend learning. As reported by Vivian Stewart, vice president for education of the Asia Society, "Currently, only 40 percent of Chinese students go to upper-secondary schools." That is, past the 9th grade. "Its long-term goals include: a world-class education for the top 5 percent to 10 percent of high school students; universal 12-year education by 2020...." ("China's Modernization Plan", Education Week, March 22, 2006). China has come a long way and its plans, as outlined by Stewart anyway, are impressive but it has quite a ways to go. Fourteen years ago, Lena Sun in the Washington Post noted that "many state-run schools [in contrast to the private schools that have high tuitions], especially in poor, rural areas, have no heat and sometimes no electricity. Some students have to share notebooks, use pencils with no points, and sit on hard, backless wooden planks. Education is such a low priority in some areas that classrooms are used as cow-sheds." They should file an adequacy suit. What most struck Sun was the press for conformity starting in pre-school: "Every child gets his or her cot ready for the required nap, whether they are sleepy or not. There is virtually no unstructured time...Even toilets breaks are scheduled into the day; the children squat together over one long trough in the communal bathroom." ("Chinese Swaddled, Not Coddled," March 20, 1993). The state of rural education in China was shrewdly captured in a 1999 movie, Not One Less, by Zhang Yimou (Red Sorghum, Shanghai Triad, Ju Dou, Raise the Red Lantern, The Story of Qiu Ju, Riding Alone for Thousands of Miles, House of Flying Daggers, etc). A 13-year-old girl is pressed into service as the teacher for a one-room school house when the regular teacher must return to his home town to perform filial duties following the death of a parent. The film deftly contrasts the old poverty of rural China with the new poverty of urban China. Why is it that education "reformers" feel obligated to idealize education elsewhere and demonize it here? After Bill Gates' demonizing speech to the National Governors Association in 2005 (Gates is 50% of the $60 million behind the ED in 08 campaign), I wrote an article, "Yo Bill Gates: If You're So Rich, How Come You Ain't Smart?" I wrote about the general fear-mongering tendency in Stanford Magazine's July/August 2006 issue, "Believing the Worst." Putting the title and "Bracey" into Google will pull up the article. A much shorter, but slightly more current version is here. Somebody needs to shake up ED in 08. In the meantime, as my granma, a school teacher with an 8th grade educaton used to say, "Don't pay 'em no mind." 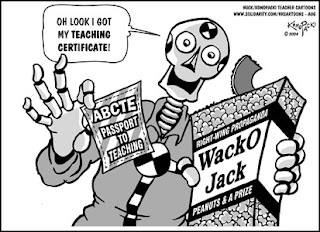 Part of neglected NCLB story that goes unreported is the bogus rhetoric on "highly-qualified teachers" that masks a concerted effort to weaken the teaching profession by credentialing unprepared and under-educated teacher candidates. Short of blowing up colleges of education, which is the preferred solution by Bush's crackpot reading czar and co-conspirator in the Reading First corruption scandal, Reid Lyon, the Bush Administration has done all it can to undercut teacher education programs and the progressive educational philosophies that are a part of those programs. (BCN) SAN FRANCISCO A coalition of activist groups and parents filed a federal lawsuit in San Francisco Tuesday against the U.S. Department of Education and Secretary of Education Margaret Spellings charging that the department has violated the No Child Left Behind Act by certifying under qualified teachers as being "highly qualified." The act, signed by President George W. Bush in 2002, requires that only teachers who have a full state credential be considered "highly qualified." However, the department has issued regulations that allow states to label any teacher currently participating in an alternative credential program while teaching as "highly qualified," according to the plaintiffs. The lawsuit argues that the department is violating the law, deceiving parents and harming the educational development of children by labeling beginning and intern teachers as "highly qualified." "Providing all students with highly qualified teachers is the only way to ensure that no child is left behind. Defining teachers in training as 'highly qualified' violates both the letter and spirit of the law, primarily to the detriment of low income students of color," according to plaintiffs' attorney Jenny Pearlman of the law firm Public Advocates Inc.
Lorie Chinn, a board member of the activist group California ACORN, one of the lawsuit's plaintiffs, said that schools teaching poor and minority children have a disproportionate share of these intern teachers and because of the DOE regulation the schools' parents often do not even realize it. "Parents deserve to know when their children's teacher is an intern," Chinn said. The lawsuit seeks to have the DOE regulation ruled illegal and the definition of a "highly qualified teacher" that is in the NCLB Act be used instead. "If we prevail, the suit will have ripple effects throughout the implementation of NCLB nationally," Public Advocates staff attorney Tara Kini said. "States and school districts will no longer be permitted to concentrate teachers in training in schools serving high numbers of students of color, and they will be required to report accurately the numbers of 'highly qualified' teachers so that real plans can be made to get better trained and qualified teachers to all students." According to Public Advocates, more than 10,000 intern teachers are labeled as "highly qualified" each year in California. Nationally the number is more than 100,000. In addition to California ACORN the other plaintiffs in the lawsuit include the activist group Californians for Justice as well as a number of individual students and parents. The suit was filed in U.S. District Court in San Francisco. A federal judge has rejected the latest attempt by the University of Phoenix to shortcircuit a potentially massive lawsuit it faces, increasing the chances that the five-year-old case actually goes to trial. Phoenix officials had their way in the early court battles, with a federal district court twice dismissing the lawsuit in 2004. But the university’s fortunes began to ebb with the September 2006 ruling by the U.S. Court of Appeals for the Ninth Circuit that was seen by many college lawyers as one of several recent decisions expanding the applicability of the False Claims Act to higher education. Since then, the entire Ninth Circuit court denied a Phoenix petition asking it to rehear the case, and the U.S. Supreme Court refused to hear Phoenix’s appeal. . . . The Bloomberg/Klein Plan to Segregate the "Laggards"
During the early 20th Century heyday of the American eugenics and social efficiency movement, primitive intelligence tests were used to "scientifically" label children so that the "defective" ones could be segregated into industrial education schools. Now it appears that the Bloomberg braintrust is about to use the failures generated by their non-stop achievement testing policy to launch an updated kind of reform school, this one intended to academically cleanse the crumbling high schools ahead of the grand plan to charterize the entire system. Bloomberg and his corporate pals have plans to funnel millions of tax-deductible dollars through non-profit corporations to spread these secondary-level academic chain-gangs they are calling "transfer schools," where the curriculum will consist of non-stop, intensive remediation. You have to wonder how many cops will be required. Faced with 70,000 students or more who are years behind in obtaining the credits needed to graduate from high school, New York City is at the forefront of a movement to recognize that for a significant number, high school might stretch into five, six, even seven years. In an effort that has expanded across Mayor Michael R. Bloomberg’s second term, the city has spent nearly $37 million to identify and cater to students who are at the biggest risk of dropping out and has already contracted for $31 million more in programs. The staggering numbers of those who are far behind cover almost a quarter of the city’s public high school population — students like Sunil Ragoonath, who at 18 had passed barely enough courses at John Adams High School in Queens to be considered a sophomore. He routinely skipped school. “All I had to do was walk out the door,” Mr. Ragoonath said recently. To get younger students who have failed many classes back on track, Schools Chancellor Joel I. Klein has created more than two dozen “transfer schools,” and plans to open as many as 30 more over the next five years. The city also offers them intensive remedial courses. . . . When people have said "poverty is no excuse," my response has been, "Yes, you're right. Poverty is not an excuse. It's a condition. It's like gravity. Gravity affects everything you do on the planet. So does poverty." Obviously, poverty, per se, does not cause school failure. It sets up the conditions and a dynamic that make it tough for poor kids to succeed. Perhaps the quickest way to understand that dynamic in the concrete is to read passages in Linda Perlstein's new book, Tested: One American School Struggles to Make the Grade. Former Washington Post education reporter Perlstein spent a year in Tyler Heights, a poor school in a rich county (Anne Arundel, MD). The kids get off to a bad start physically: they get sugar water or Oodles of Noodles as infants, Froot Loops as toddlers and show up at school overweight, undernourished, their teeth rotting. "Mrs. Facchine felt no small measure of distress when she asked what adding an 's' does to a noun and every face in her class went blank. Mill Milhoan was mortified when she handed out Post-it notes for questions about friendship and got back, "Ho do friend go yon" and "The kestos is the kmblso." One girl doesn't know what a paragraph is; one boy asked the character trait that describes him said, "Word." Another, asked how much is between seventeen and eighteen answered, Four." I hear complaints about teachers treating kids as passive vessels. Given the school-oriented knowledge deficits these kids have and the behaviors that actively prevent learning, more progress could be made if they were passive vessels for a while. One teacher was baffled by a boy who farted all day and announced, "I smell like salad." There was the boy who, complimented on his new sneakers and said, "Thanks! My mom stole them!" During sharing time, one girl spoke of speaking to her father through the glass using a phone. One girl, asked the meaning of "stray," said "Like a homeless person." "Is Mars a lifetime?" One boy wanted to know. On multiple choice tests, kids answered the questions without reading the stems and quit early, beaming to be done even though segments of the test were unfinished. And we haven't even talked about kids who don't know English. Passive would be good for a while. A third grader, denied a request to see the nurse (again), "put her face in her teacher's and said, "Excuse me. My rash hurts. What if I die?'" Then she swung her book in front of the screen, blocking a math problem, hopped to the side of the room, ran the faucet and created so much tension that all the other children were distracted. "I'll have to remove you," her teacher said. "I'll have someone remove you too!" said the girl. Comments Perlstein at one point, "The amount of individual attention that goes into soothing the truly dysfunctional children and keeping them in class is extraordinary" (p. 110). Occasionally, physical restraint or a police officer's visit was necessary (remember, we're talking mostly about kindergartners to third graders here), but mostly through conversation which some children required daily. In Chapter 11, Perlstein contrasts Tyler Heights with Crofton Elementary in an affluent development I used to admire each summer as I drove from Virginia to the jazz joints in Manhattan, although, I wondered then why the gates were shut, a knowledge shortcoming from my own cultural upbringing. Crofton is no longer a gated community, but its third graders "created fairy tales on the computer, posted staff biographies on the school's website, and wrote 10 persuasive letters. They sat in circles, discussed what they read and proofread one another's work." Fifth graders studied the political positions of candidates and ran a bank and managed savings accounts. Fourth graders gave speeches on Olympic sports (some of them had been to the Winter Games in Turin). Despite the presence of NCLB and its obsession with reading and math, they get 45 minutes a day of science or social studies which included maintaining a compost pile, making tortilla tepees and sugar cube igloos, creating picture stories about Native Americans and composing pictograph stories on faux animal hides. Perlstein observes that NCLB and the standards movement, designed to reduce the disparities between rich and poor has actually increased it. "The practice of focusing on the tested subjects of reading and math at the expense of a well-rounded curriculum is far more prevalent where children are poor and minority" (p. 136) (I discussed this also in "Revenge of the Liberal Arts?" August 15, and "Growing an Achievement Gap," July 15). Says Perlstein, "President Bush, in introducing NCLB, vowed to banish the 'soft bigotry of low expectations' for the nation's disadvantaged children. To condemn them to a rudimentary education in the name of improvement is bigotry too." Crofton kids arrive as kindergartners knowing their numbers and letters. Many can read. "Middle class students see every day how schooling relates positively to the riches of everyday life. They see this through their parents' jobs. They see this through travel and cultural exposure that extends beyond the Chuck E. Cheese's-shopping mall-television circuit that narrowly bounds the experiences of many children at Tyler Heights. This exposure fuels motivation..." (p. 137). Kids at Tyler Heights get many, many external rewards for doing what they are supposed to. Crofton kids don't get any. Crofton doesn't even have an honor roll. Tyler Heights is about prepping for the state test (even though the teachers hate to). Crofton is about knowledge. These are only brief snap shots of life at Tyler Heights where Perlstein paints the teachers and, especially the principal, as pretty damn heroic. You might want to show them to the next person who tells you "poverty is no excuse." As appealing as teacher-bonus pay might sound, the idea never had much luster in Florida -- and it's losing what little it had. Unions hate it. Teachers scorn it. Administrators find it a hassle. The disdain is so complete that some of those who benefit from the extra money -- teachers and administrators -- are asking lawmakers to ax the program when they meet in special session next month to deal with budget shortfalls. Even if teacher bonuses survive, legislators and school officials expect that school districts from the Panhandle to Miami will opt out of the newest bonus program. "I do support performance pay if the teachers and administration and School Board collaboratively develop a plan," said Margaret Smith, superintendent of Volusia County schools, which nixed the bonuses last year. "I do not think this year is the year to spend millions . . . when the state says we may have to lose millions." In Central Florida, Osceola County already has said no thanks to the money that would reward teachers next year. Orange County, emerging from the error-riddled, controversial program, is expected to steer clear as well. But legislators love merit pay and are digging in to save former Gov. Jeb Bush's plan to reward top teachers. Cutting the $147.5 million program "would send the wrong message to teachers," said Rep. Joe Pickens, R-Palatka. He and his colleagues promise to massage it into a bigger, better program. . . . Call it a rookie political mistake. Its one thing for a politician to lend a hand to his constituents, particularly the ones who can afford to make campaign contributions. But please; be discreet. Last week Nebraska Attorney General Jon Bruning ordered Nelnet, a student lending company caught up in the recent industry-wide scandal, to pay a fine of one million dollars. Nelnet has, at least twice, paid university administrators who recommended that students finance their debt through the firm. The company is also hired by universities to educate students about how to pay for college; not illegal, but surely a conflict-of-interest practice that they have agreed to stop. So what’s wrong with this picture? Nothing, except the million dollars is actually a fine that Bruning assigned the company all the way back in April, a fine that he forgave only two weeks ago. Bruing erased the fine after New York Attorney General Andrew Cuomo ordered a similar punishment for Nelnet. Cuomo has made investigating student lenders a focus of his office; already, several banks have been ordered to contribute to a national education fund. Cuomo announced on July 31st that Nelnet would be paying $2 million to the fund. Upon hearing the news, Bruning immediately forgave Nelnet his part of the obligation. He also used the opportunity to take a few shots at his fellow AG, saying that he “never believed that the investigation was particularly useful.” Bruning went even further, saying, "Nelnet is an ethical, decent, honest company…. I will never apologize for being a defender of Nelnet." Admittedly, that statement is a bit misleading. After all, Bruning was removing a fine that his office placed on the company; Bruning somehow styled himself both prosecutor and defender. But more importantly, Nelnet doesn’t exactly have a sterling reputation. Only a few months before the original settlement, Nelnet settled another deal with Secretary of Education Margaret Spellings. For two years, Nelnet had falsely classified a large collection of loans, resulting in a huge government subsidy. (The government will guarantee student lenders a return of 9.5% on certain types of loans. Nelnet incorrectly identified some loans, allowing them to earn twice market value on the investments.) Spellings informed the company that they would not be able to collect future subsidies on the mislabeled loans, but she did allow the company to keep $300 million in taxpayer money that it had already received. Maybe Bruning was just sticking up for Nebraska (Nelnet is based out of Lincoln). Then again, Bruning might have been getting on better terms with a firm known for its generous political contributions. Bruning has announced that he will run for the possibly vacant Senate seat of Chuck Hagel (R). HigherEdWatch.org, whose extensive coverage helped keep the story alive, has noted that the original settlement came only weeks after Bruning’s campaign got a $16,000 boost from Nelnet execs. In fact, the settlement was announced without Bruning’s office ever launching an investigation (presumably, Nelnet approached Bruning in the hopes of avoiding Cuomo’s investigation). For now, the fine has been reinstated, and Bruning has hopefully learned a lesson both about conflicts of interest and discreet politics. He recently declared in an interview that the resurrected fine “eliminates the opportunity for political gamesmanship by those who may want to create the perception of a conflict of interest.” We’ll see if his opponents agree with him. D.C. Charter Schools: "Nearly Nonexistent Oversight"
Former charter school executive Brenda Belton was able to steal or illegally steer to friends more than $800,000 over three years because of nearly nonexistent oversight by an inattentive school board, an 18-month criminal investigation found. Even when a school employee warned board members in spring 2006 that something was amiss about the invoices Belton was approving, a divided D.C. Board of Education initially dismissed the report as unsubstantiated grousing rather than fire Belton. So the whistleblower employee took his concerns to the D.C. inspector general, who, along with the FBI, got a search warrant for Belton's home and office. The red flags he spotted -- noting, for example, that Belton rarely showed up for work -- eventually formed the crux of a federal criminal investigation that led to Belton pleading guilty Aug. 9 to four felonies and facing significant prison time. In admitting her crimes in federal court, Belton, 61, said that from the time she was hired as the board's charter school oversight executive in March 2003 until just before she was placed on leave in June 2006, she robbed the troubled D.C. school system of both federal and city funds. The D.C. native admitted steering $446,000 in no-bid contracts to friends, sending $203,000 in school money to a dummy company she fabricated and taking $180,000 in kickbacks and gifts from contractors she helped win school business. She faces up to three years in prison under sentencing guidelines. Her sentencing is scheduled for Nov. 29. The investigation of her misdeeds -- led by the D.C. inspector general and the U.S. Department of Education's inspector general -- suggested how Belton could so successfully steal without being detected. She reported directly to the board, which lacked any formal structure for checking on her. There were numerous instances when the school board didn't notice red flags or failed to look more closely into them. "The board had a lot on its plate, and on one piece, the ball was really dropped," said former board member JoAnne Ginsberg. "The board didn't pick up oversight responsibility the way it should have. People weren't paying attention." One institutional flaw, former board members say, is that the board had Belton report solely to them. The chief financial officer had no responsibility for reviewing her books. Board secretary Russell Smith recommended that Belton report to him, but the board voted against that idea. That meant that a group of overwhelmed, part-time volunteers were supposed to scrutinize Belton's work. No one took on the task. In the wake of the Belton investigation, the board gave responsibility for monitoring charter schools to a public charter school board. Is it possible or likely that the purposes and aims that you will pursue and promote as an educator are or can be realized by all American children, regardless of race, gender, or where they happen to go to school? Using evidence supplied from this course, explain how and why your most important educational purposes or aims are equally accessible – or how and why they are or cannot be equally accessible. American education should be an equal-opportunity endeavor, but it is not. History has seen a constant struggle for democracy in education. Educational thinkers and policymakers have grappled with the question of how to give all students equal educational opportunities, yet even today, equity in American education is lacking. As a result of No Child Left Behind, the country is experiencing a frenzy to close the achievement gap between white and minority students. The unfortunate irony of NCLB, however, is that it is creating inequity in education rather than alleviating it, for the law is effectively harming precisely those students it purports to benefit: minority students, students with learning disabilities, and students whose first language is not English. Thus, my aforementioned aims [to cultivate a love of learning in my students and promote an ethic of care] as an educator are not equally accessible to all American children, regardless or race, gender or where they happen to go to school. The current emphasis on test prep makes fostering a love of learning nearly impossible, and the push to bolster the scores of some students while letting others fall through the cracks precludes an ethic of care in education. My first aim as an educator is to cultivate a love of learning in my students by engaging their interests and making the classroom experience a positive one. However, if I am forced to teach to a test, that aim is made almost impossible. Many critics of NCLB say it is an attempt by the federal government to implement a standardized curriculum in public schools. Scripted lessons and “one-size-fits-all” curriculums are the antithesis of engaging and interactive learning. As Jaeger points out, “Teachers find that their work has been reduced to follow a scripted teacher’s guide, passing out worksheets, and drilling students on isolated skills,” (chapter 6). How can I, as Dewey and Noddings suggest, take my students’ individual needs and interests into account when I must deliver a robotic lesson or drill test strategies into their heads? It seems to me that NCLB unfairly makes teachers more concerned about ensuring students are proficient in math and reading for the sake of a test than providing them with a wholesome, fulfilling education. Not only does NCLB lead to robotic teaching and narrow curriculums, it also reduces learning to filling in blanks and bubbling in scantrons; that is, it sends the message that the purpose of learning is to pass a test. According to Dewey, learning needs to be made relevant to students’ lives so that they will seek out more positive educative experiences in the future. In order to achieve my aim of cultivating a love of learning in my students, I have said that I will try to help them see the relevancy of the material to their daily lives. But if I can only justify the relevancy of my lessons by saying, “You need to know this for the test,” that aim is effectively derailed. The last thing students want to hear is that they must absorb the information because they’ll be tested on it later. High-stakes testing turns students off to learning. School must be made relevant to daily life so that students can realize the immediate impact of their educative experiences. The current testing craze greatly inhibits that aim. The law also is antithetical to my second aim of promoting an ethic of care in the classroom. The very name of the law, “No Child Left Behind,” sounds caring enough in theory, but the reality is that it cares very little about the welfare of America’s children. It is largely ineffective in providing support for the students who need it the most. It expects children with learning disabilities to achieve at the same rate as other students, yet states are not allowed to make provisions for alternative tests or significantly modify testing conditions to make that possible (Jaeger, chapter 3). Furthermore, higher qualification standards for paraprofessionals has forced many of them out of their jobs, which means students with learning disabilities are not receiving the extra support they need (Jaeger, chapter 5). English language learners who have been in the U.S. for at least a year face a similar unrealistic and unfair expectation, for they are required to take a test that is not written in their first language. What’s even worse is that when it comes to intervention services for struggling students, many districts now focus on “those children who are considered ‘pushables’ (those just below passing) and ‘slippables’ (those at risk of slipping out of the proficient category),” according to Jaeger. “When one teacher asked what was to be done for students in dire need of extra help, she was told by her principal to ‘forget them’” (chapter 2). How can teachers care about each and every student when they are being told to forget about those deemed lost causes? And how can teachers show students they care when they cannot gauge their understanding of and response to the material, as Jaeger describes when she writes, “ They are unable to respond appropriately to the diverse needs of their students because required adherence to a rigid pacing schedule forces them to move full speed ahead whether students understand the lessons or not” (chapter 6)? Noddings says every child has the potential to achieve. It is our responsibility as caring educators to help students realize their potential, yet NCLB prevents such a caring approach to education. Furthermore, NCLB makes it advantageous for schools to let drop-outs fall through the cracks. The provision of the law that it supposed to help schools with high drop-out rates implement prevention programs has a $0 budget, and “other provisions of the law serve to diminish rather than increase incentives for keeping all students in school,” (Jaeger, chapter 7). “There is a reason for excluding from testing lower-achieving students...by transferring or expelling them, or by encouraging them to drop out. If these students leave school, they do not participate in the tests which determine whether schools are deemed under-performing,” (Jaeger, chapter 7). Thus, NCLB effectively encourages schools to not care about lower-achieving students who are likely to drop out. One hardly needs to point out how this goes against an ethic of care. Thus, it is clear that society’s emphasis on standardized test scores, as well as the federal government’s intrusion into the educational system, makes the realization of my most important educational aims highly unlikely or nearly impossible. But, to end on a more optimistic note, there is hope for me yet, as No Child Left Behind is up for re-authorization this September. Repealing the law would make my aims more feasible. Dewey, J. (1938/1997). Experience and education (reprinted ed.) New York: Touchstone Books. Dewey, J. (1938/2000). Experience and education. In R. Reed & T. Johnson, Eds., Philosophical documents in education (2nd ed.) (pp. 115-124). New York: Longman. (Reprinted from Experience and education by J. Dewey, 1938, Indianapolis, IN: Kappa Delta Pi, pp. 33-50). Dewey, J. (1897/1972). My pedagogic creed. In R. Reed & T. Johnson, Eds., Philosophicaldocuments in education (2nd ed.) (pp. 103-110). New York: Longman. (Reprinted from John Dewey: The early works 1895-1898, vol. 5 by J. Dewey, J.A. Boydston, Ed., Carbondale, IL: Southern Illinois University Press, pp. 84-95). Jaeger, Elizabeth. What every parent, teacher, and community member needs to know about No Child Left Behind. Unpublished manuscript. Noddings, N. (1992/2000). The challenge of care in schools: An alternative approach to education. In R. Reed & T. Johnson, Eds., Philosophical documents in education (2nd ed.) (pp. 247-257). New York: Longman (Reprinted from The Challenge to Care in Schools: An Alternative Approach to Education, by Noddings, 1992, New York: Teachers College Press). Tyack, D. (2003). Seeking common ground: Public schools in a diverse society. Cambridge, MA: Harvard University Press. I wish that all my colleagues could say as much on the subject as well.